Comments on "On the Street....Face Graphics, Milan"
i can appreciate this b/c i love a face. but, i don't necessarily love it on my clothes. i like the way they look, but i don't love it. Never a fan of t-shirt graphics. Always distracting and more importantly always detract from the wearer. I think they should be left alone. I love the pants in the second photo! LOVE the sunnies in the top photo. The Chuck Close t and checked pants are fun, but the top photo...well...sometimes two heads are not better than one. the top one is so great. 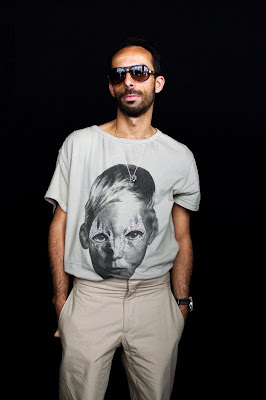 love tshirts tucked in and how the glitter on the face takes away from the possible formality of the trousers (anyone know what brand they are?). i wish i could see what shoes he's wearing. I am not sure, but I don´t think it´s a pixelated face look, but an oil portrait from Chuck Close. the second pants are abs.cool! Those are some great t-shirts. Whowhatweardaily just did a great post about them. Those checked pants are awesome..nice to see men taking risks! Wow Such cool pants, where are they from? You look cool. Yes, you do! FYI: Second one is Chuck Close's portrait of Philip Glass. It's either in the Whitney or Guggenheim, I don't remember. I think the tshirts are brilliant even if I may not think they're suitable for the wearer or paired well. What confuses me about the first guy is that he clearly likes hiding as much of his face as possible between his facial hair and sunglasses yet he draws huge attention to himself with the choice of tshirts. LOVE number 2's checkered pants (bright, but not too bright! Where can I get a pair in women's sizes? ), and the delightful irony that the face on his shirt is bigger than his own. xD I actually used to know a young "punk" who dressed like this... Awesome shot! Love, love, LOVE the Chuck Close t-shirt. Would recognize his faces anywhere. i love those checkered pants and I want them for myself. But the first picture has me sold, top to bottom. He works it. I dig the white shoes against the blue checkered pants and the shoes tie the white graphic tee in well. I have to have those uber cool checked pants! How fun! It is kind of cool how this man kept the theme by wearing a t-shirt with a Chuck Close image, which is made up of many little blocks. A very, very neat and well-thought out look! one of those pictures i closed and then had to reopen just to see how much i liked it. which was when i saw the little belt tail sticking out from under the t shirt, question is whether or not he pulled that little number out on purpose and if so whether i like that more or less for the obsessiveness. great checks. It's so easy to make your own. Why pay a lot of moolah just to give free advertisement for some label? how graphics should be done! the pants in the second aren't great, but the first is exquisitely laid back and just plain cool. you and I've similar tastes, I think. The first guy makes me smile and laugh! I love his pose, it's hysterical. The second guy looks ok. But I think he's trying too hard. I can see it more on a teenager who doesn't know better. gosh i was looking for that chuck close tshirt at every gap i came upon, but alas, no luck. looks good on him, what with the bald and all. anyone know where the shirt and pants are from in the first portrait? much appreciated! I facial expression communicates alot and, with a face tee it is very easy transmit the message that you are going for. in both pictures the pants are complimenting the message of the tee, which is the key to style that your outfit supports itself. a facial expression communicates very clear there is a lot to capture. If you find one that you like your a lucky man. also notice how there outfit is based on the face each of them have garments that support the face it is the man piece for the day. Love everything about how he is dressed! The t-shirt, sunglasses, pants, and shoes--head to toe! WONDERFUL!! Other than the fact that their pants fit better, I see no difference between these guys and the typical American hipster. The first pic is genius! His tanned skin with the tone of his clothes is harmonious. The fit and quality of the tee is much greater than that of the gap one, making it much more appropriate for a dress pant. Art and fashion here collide to my liking. Does anyone know where the first shirt is from? Would rather see art on a wall (we're lucky to have three Chuck Close originals in my office! ), but it bothers me more that in the top photo the face is tucked into the man's pants. It just seems bizarre. Flat-front slacks are so distracting. Pleats please. I am a fan of both the checkered pant as well as the face/graphic tees. I agree though, sometimes it can be distracting. I bought the same Prada pants, in my opinion are overlong, anyway love the second look!! I'm a designer and one of my pieces is also a face design on a tee. We were originally inspired by the face series designed by Harlow Monrow which featured Kate Moss and Marilyn Monrow, however we wanted all our designs to be more than just a face. Thus we painstakingly designed a series called the COLOR ME series which featured the faces of super models in a paint by numbers stencil. The concept was a commentary on the perception of beauty and the socialization of race differentiation. You can check it out and comment at www.soscloth.com. I think the style of using faces alone has be done and over dnoe. The Chuck Close version is an exception because of the technique used to produce the shirt, it is not only a halftone design but it also uses flocking or some sort of sewing to created the half tone dots which is completely new approach to the face. It's not just another silk screen which is so common place as of late. I love the fit of the first guy's shirt so much. Anyone knows the brand of the first t-shirt, please? pd=Before asking I looked up for it and no result. 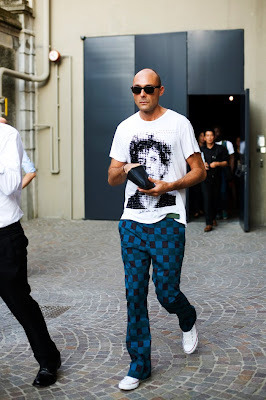 I adore that man's getup - the one below - with the checkered pants and the face t-shirt. I would totally rock that, and I'm a chick. Agree that the check pants in photo two are great, but the look in photo one is the winner for me; the t-shirt is a bold statement, backing up the pose and the glasses to say: I defy you to read/interpret/translate me.